Grieving relatives of the Blairs being taken away. 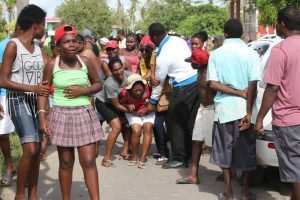 Family members as well as the Berbice populace were shocked when news of the Canje murder/ suicide spread throughout the town of New Amsterdam. 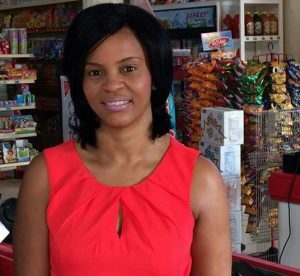 No one expected that on a quiet Friday morning, businessman and owner of the Stretch D’ Dollar chain store, 46-year-old Rudy Blair would take his own life or was even capable of brutally stabbing his ex wife,42-year-old Rhonda Blair to death. Yet this was the sad reality. Police earlier in a release stated that investigations are ongoing into the murder of the businesswoman, of 91 Coburg Street, Cumberland Village, East Canje, whose body was discovered, about 12:05hrs on Thursday in her yard with two stab wounds; one to the left side breast and the other to the right side neck and the suicide of her ex-husband. His body was discovered with two suspected gunshot wounds to the left ear and left side chest, at about 08:40 am on Friday in some bushes at the back of his premises. His licensed .32 pistol with six live rounds and one spent shell were found next to his body. While information about why the man committed the act remains sketchy, residents in the area have conjured their own theories based on previous events that led to the end of the couple’s relationship. A close relative of the now deceased couple who operated a grocery parlor in the bottom flat of their home relayed to this media outlet this was no spontaneous act. In fact, she stated that for several months, Blair had dropped hints and spoken plainly that he was going to murder the mother of his children. The woman, who wished to remain anonymous, stated that on Thursday afternoon, Blair met with his ex-wife and her friend while they were shopping. He eventually convinced the woman’s friend that he would take Rhonda home. But this never happened. Instead, he returned to their Lot 1 Cumberland, East Canje home and told the her that GRA officers were on their way to seize her goods. She, in fear of losing her business, immediately locked up her shop and went away giving the man a clear opportunity to take his ex-wife into the yard where he committed the brutal act of stabbing her multiple times. The woman’s body was later found lying in a pool of blood in the bottom flat of the home. The body was positioned next a few beer bottles which suggested that the man consumed alcohol moments before murdering his ex-wife. The relative disclosed that she was forced to take away the man’s gun the previous Sunday after he sat in the presence of others and stated that he would “take Rhonda out”. “He sat on the steps and he took out his gun and said you see this? I would take Rhonda out and I tell him ‘Rudy calm down’ and I took away the gun. He pick up a hammer and I tek it way. He pick up my cutlass and I tek that and the gun and hide it from him. But I give him back cause’ me ain’t want problems. He would always say that he gon’ kill her so this ain’t something he just now decide to he. Months now he saying he gon’ kill she”. She also disclosed that Blair weeks prior to the incident, stole some of the poison bought to kill weed in the yard. The relative said that the man employed to spray the poison saw Blair threw out a quantity into a bottle and left. When she (the relative) later confronted him, they had a brief exchange of words. “The man come and tell me that Rudy throw out some of the poison and he gone with it so I hurry hide the rest and went to ask he and we argue lil bit and he left”. However, family members are painting a different picture of the suspect. The man’s nephew, Leonard Fortune, speaking to the media earlier at the scene described him as a family man who had an active church life. “My uncle always in church and was always helpful to us so when I heard the news I was shocked. I never would expect him to stab Aunty Rhonda. This is just a shock to everybody. He didn’t have to do this”. Another relative stated that despite having financial constraints, Blair always kept a cool head and remained the loving person that he was. “Even after they lose the business, he always smiling, always laughing and never show none of us a bad face. Is like something snapped in him and he couldn’t take the pressure anymore. But he didn’t had to kill her or himself. If he had talk to somebody, anybody, this coulda been prevented”. 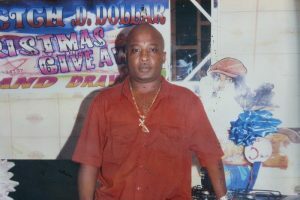 The Blair’s were once the owners of three Stretch D’ Dollar stores in Berbice, but the business has declined over the years due to family disputes. Meanwhile, a Post Mortem examination done on Rhonda Blair revealed that she succumbed to shock hemorrhage due to the stab wounds sustained.